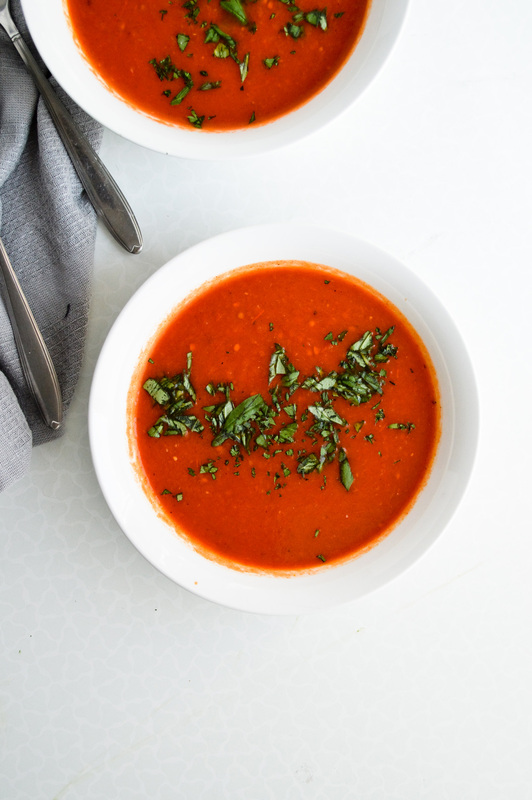 Get those ripe, juicy tomatoes and make roasted tomato soup! 10 days without a new post. Can’t say that I’m proud of that. But if June and July were easy breezy beautiful covergirl, August has been tough. Well, it’s been nice in some ways, we’ve had some rain and on some days it felt like we were already in October which made me really happy, but other days were tough. My camera, the only proper camera I have to take photos with for the blog, broke. It actually stopped working as I was making this soup, which makes this recipe special on a whole new level. Somewhere between roasting the tomatoes and serving the soup, the camera decided to give me the middle finger. It wouldn’t auto focus anymore, and even though the manual did still work, I was not prepared for that. Taking pictures when I’m sweating like I’ve just ran a marathon, shaking because I’m in a hurry as the sun is dying on me, well, that’s not when I want to shoot in manual. That was last week. This week I had one of my wisdom teeth removed. So much fun. While the right side of my face still hurts and I can’t eat adult food, it’s all going much better than expected. People always freak out over wisdom teeth and I was pretty scared when I went to the dentist’s, but I’m better now. You probably didn’t know this about me, but I’m really afraid of dentists. I wasn’t as a kid, but I had one horrible experience once with one particular butcher, I mean dentist, and it was enough to scar me for life. Luckily this new generation of dentists seems so much better. And by new generation I mean young, very nice and professional dentists. All male for some reason. But having a nice doctor really makes all the difference in the world. The kind that constantly asks me if I’m feeling okay, that tells me to raise my hand if something is wrong, that explains what he’s doing or is about to do, the kind that smiles and even tells a joke if the time is right. No big surprises and usually no pain. Now, let’s go back to food. Here’s what I’ve been eating for the past 3 days: ice cream, rice cereal, banana smoothies, more ice cream, apple sauce, lukewarm mashed potatoes. I feel like a baby, but I’m just following orders. Although having to eat ice cream hardly seems like punishment. Cold soup is good too. 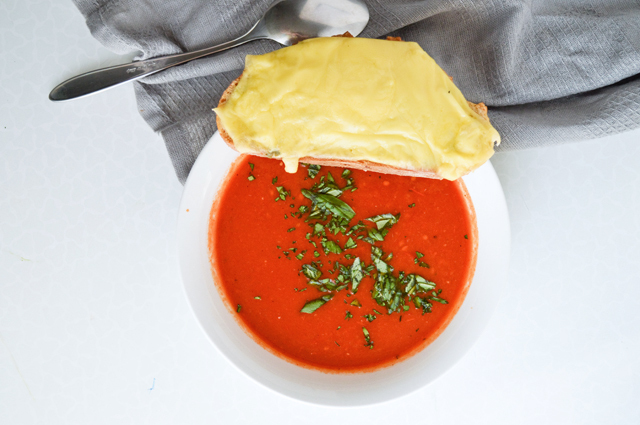 Like this roasted tomato soup. And as summer is coming to an end, I really need to make the most of the tomatoes. Winter tomatoes just aren’t the same. 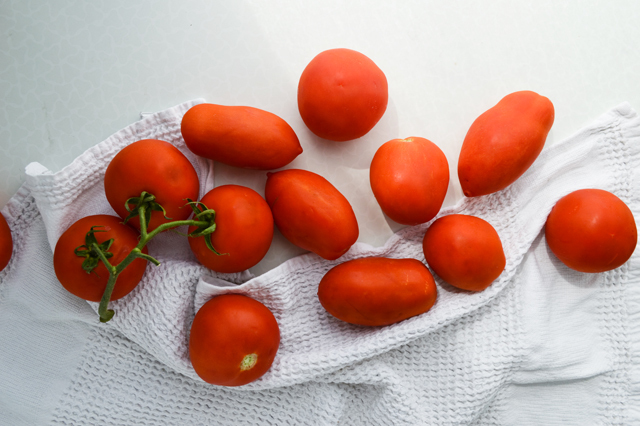 They’re usually watery and bland, nothing like ripe tomatoes when they’re in season. Which is NOW. This soup is so easy to make. 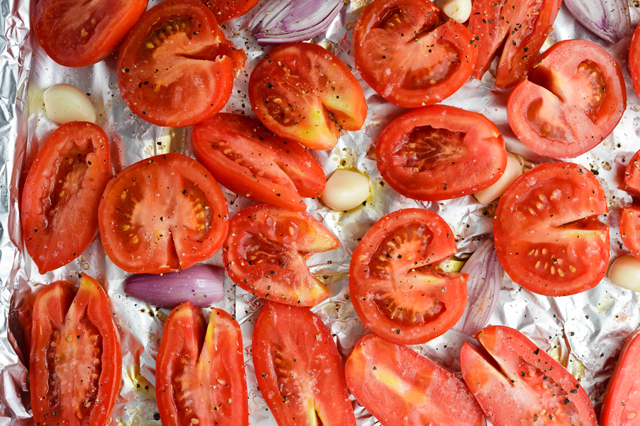 Not only are roasted tomatoes super tasty, I love how there’s no onion chopping involved. I roast the garlic and shallots with the tomatoes and then puree them all together. Delicious! To say that cheese and tomatoes go together great really isn’t a surprise. One look at all the lasagnas, margherita pizzas, pasta recipes, tomato sandwiches or caprese salads out there says it all. So, I like to add cheese toast to this soup. In my case, this includes a thick layer of sour cream under the cheese. May not sound like much, but when baked the sour cream is so creamy and amazing! 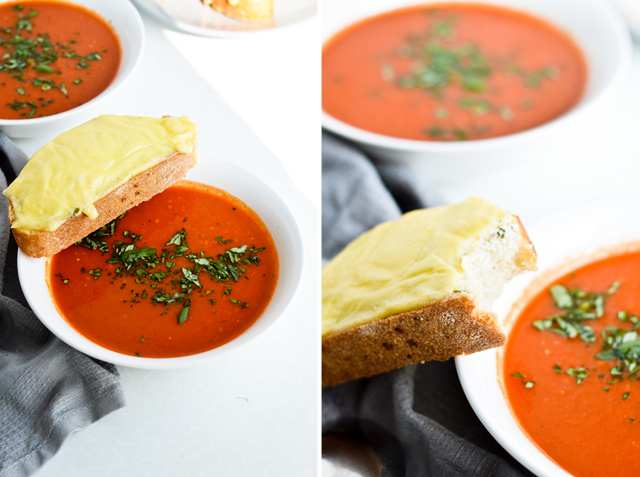 I think this roasted tomato soup, paired with cheesy sour cream oven toast, is a great late summer cozy dinner. And as soon as I can eat solids, I am making this again! And again and… you get it. Serves up to 4 people. Preheat the oven to 200°C (400°F) and line a large baking sheet with aluminum foil. 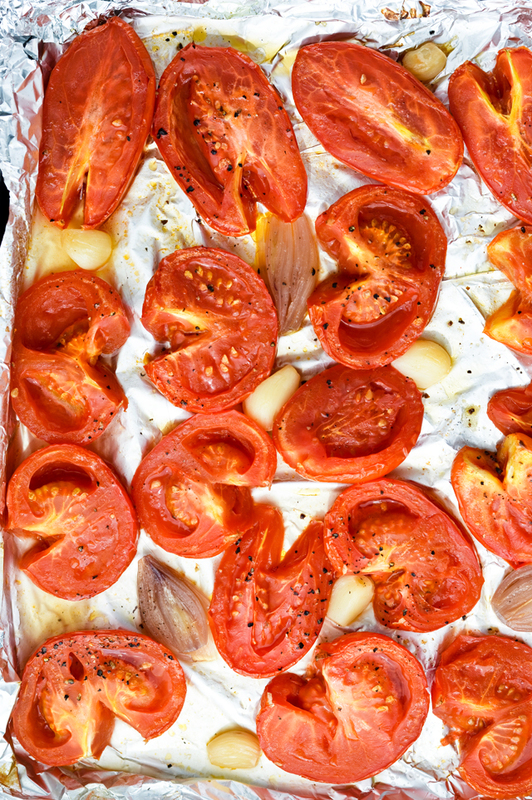 Spread the tomatoes over the baking sheet, halved side up, along with the shallots and garlic. Drizzle with olive oil, sprinkle with salt and black pepper. Roast for about one hour, until tender (the shallots will be translucent). Leave the oven turned on. Transfer everything, the juices left on the baking sheet too, to a food processor and pulse until finely pureed. Transfer to a medium pot, add the vegetable stock, tomato paste, ground paprika, nutmeg and thyme and bring to a boil. Lower heat to medium and let soup simmer for about 15-20 minutes. Remove from heat, taste and season with extra salt and pepper, if necessary. Sprinkle soup with chopped parsley and basil before you serve. 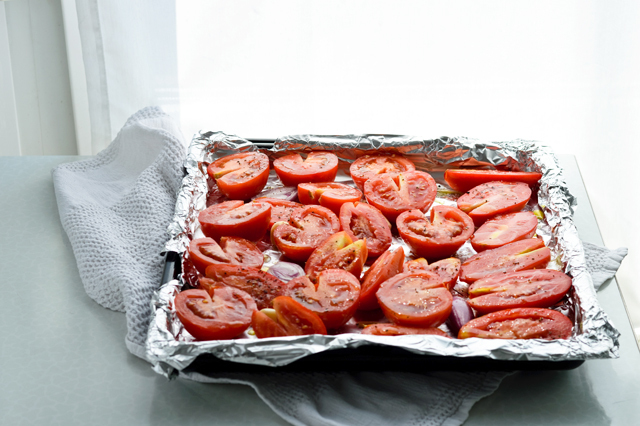 Prepare as the tomatoes roast. 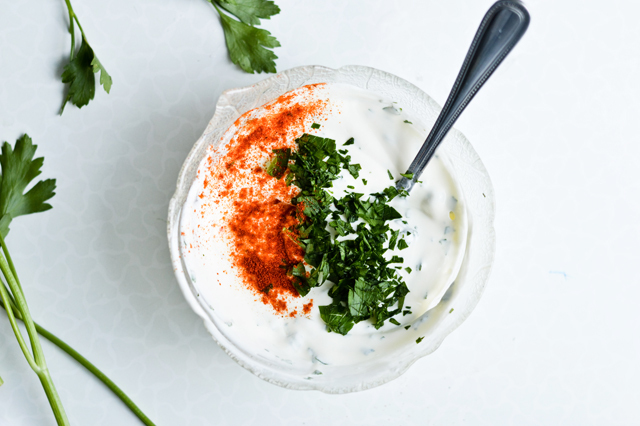 In a small bowl, combine the sour cream, ground paprika and parsley. Stir until incorporated. 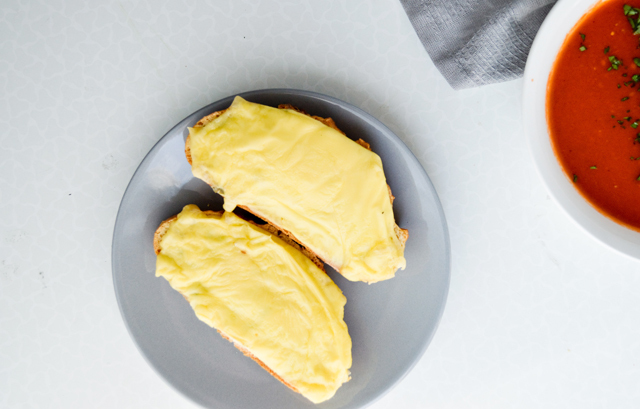 Spread a thick layer of sour cream over each bread slice. 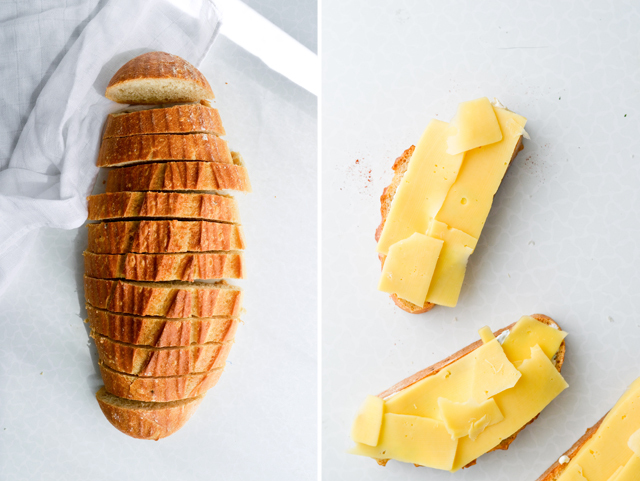 Completely cover every slice of bread with cheese. Place on a baking sheet, lined with baking paper, and set aside. Soup can be made one day ahead, stored in the fridge. Reheat before serving. I prefer to use plum tomatoes when making this soup, but often use a mixture of plum and vine tomatoes. Sometimes, if the tomatoes are too acidic, I add a teaspoon of sugar to the soup. Inspired by and adapted from Smitten Kitchen and Bon Appétit.